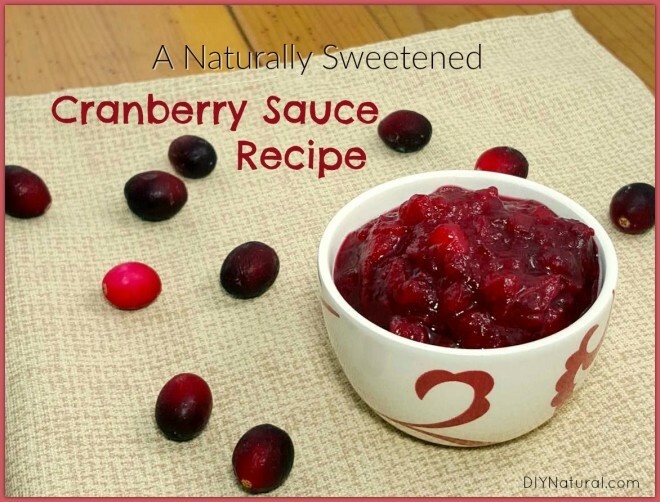 This cranberry sauce recipe is a delicious, naturally-sweetened way to bring this staple Thanksgiving side dish to your family table with wholesome confidence. In our family, you either love it or you hate it. There’s no in-between. If you don’t love it, I won’t judge, because it means there’s more for me! Often times, Thanksgiving tables are graced with that jiggly, jello-like sauce that still has the ridges of the can imprinted on the sides of the sauce. This canned version is packed with tons of sugar, mostly in the form of high fructose corn syrup. Even many homemade versions call for loads of added sugar, and it does make sense to some degree. Since cranberries are tart, you need some sweetness to balance it out – but there is another way to balance that cranberry tartness without contradicting the health benefits of the cranberries. In this homemade cranberry sauce recipe, I took a two-fold approach to the sweetener. First, I used Gala apples. Sweet Galas cook down to a nice mush, adding sweetness and creating that saucy consistency we love. But, with the apples alone, the sauce is still tart, so I added a bit of maple syrup to supplement the natural apple sweetness. It isn’t enough for the sauce to end up tasting maple-y, just enough to sweeten and add the slightest hint of maple depth. Finally, just a pinch of cloves and nutmeg give the sauce a bit of extra character, while still keeping that true and bold cranberry flavor. This recipe can be used to make a chunky cranberry sauce or a thin, butter-like sauce with just a few extra steps. In a medium saucepan, add cranberries, diced apples, water, nutmeg, and cloves. Cover and bring to a simmer over medium heat. Simmer for 10-15 minutes, until the cranberries have burst and the apples have begun to soften. Add the maple syrup and continue to simmer, covered, stirring occasionally, until the mixture has thickened, 10-15 minutes. Taste and add additional maple syrup to sweeten, if desired. Note: If you like a smooth sauce, puree the mixture using an immersion blender, or transfer the sauce to a stand mixer and puree until smooth. Return to the saucepan and simmer over medium low heat until your desired thickness is reached. Urinary Tract Infections (UTIs): Cranberries are well known for preventing UTIs. It is their high level of proanthocyanidins (PACs) that make it more difficult for bacteria to stick to urinary tract walls. Anti-Inflammatory: The phytonutrients in cranberries can help fight inflammation all over the body, including in the digestive tract, mouth and gums, colon, and cardiovascular system. Vitamin C: Sailors used to carry cranberries on their long voyages to avoid scurvy because of their high levels of Vitamin C.
Fiber: It’s hard to get enough fiber in your diet, but cranberries are a good place to start! High fiber intake is associated with lower risks of stroke, diabetes, obesity, and certain gastrointestinal diseases. Vitamin E: This vitamin works as an antioxidant to help immune function. Are you planning to serve cranberry sauce during the holidays? Have you ever tried a naturally sweetened version? Share with us below! I have been “doing” naturally sweetened cranberry sauce for years, starting when I went sugar-free. We always garnished our cranberry sauce with orange slices when I was a child, and I used to love to eat the slices, so, I went from there. Orange juice concentrate (which I wouldn’t trust now, unless you make your own) – fresh, cranberries, and stevia- which in those days, was not nearly as good as what is available now – but, get only pure stevia (although, maple syrup definitely sounds lovely). And the spices to taste. I haven’t cooked it for a while and the exact recipe is “fading” from my memory – since I never wrote it, just cooked it. I believe I will try a combo of this and my old recipe (as the apples would definitely add some nice flavor and sweetness). Hi, Love the idea of the apples in the cranberry sauce. I always make homemade cranberry sauce for the holidays as it’s the best. in too. Of course, doesn’t sweeten it, like your doing but oh, what a yummy flavor. Thanks for the idea and happy holidays.